No sooner had I returned from my previous trip to Florida/Phoenix than, it seemed to me, I was off again, back to the USA for another grand adventure as I like to call my ridiculously long trips. In reality, I had nine days between flights, which included three days at home, four days away in the UK, squeezing in visits to Foundry Coffee and Grasshopper Café, then two days at my Dad’s. And then I was off again. In case you’re wondering, no, it was not nearly long enough. This time I flew from Manchester, via Heathrow, to Boston for a long-standing social engagement. I was then faced with a dilemma. I had to be in Phoenix (again!) an annoyingly-inconvenient three weeks later. I could have returned to the UK (again), had another 9 or so days in the country, then flown back to Phoenix (again), picking up another two rounds of jetlag in the process (and no, they do not cancel each other out). Or… I could stay and use the three weeks to slowly make my way from north-east to south-west, taking in some sights as I went. No prizes for guessing which option I went for. You can see how I got on in this series of instalments of the Travel Spot, starting with my flight out to Boston. Since I’d been visiting my Dad, I started this trip from Manchester Airport, which, as regular readers will know, is not my favourite. Once again, I was flying with British Airways, going to Boston via London Heathrow. 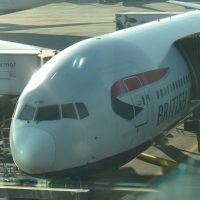 The choice of British Airways was, as before, largely dictated by the return leg from Phoenix, since British Airways is the only airline flying directly there from the UK. The somewhere-from-Manchester-via-Heathrow routing is one I’m getting used to, having done it on to my way out to Chicago last year and only a month before this trip on my way to Miami. However, on both those occasions, my flight out of Heathrow departed from Terminal 3, whereas this time, the flight to Boston was leaving from Terminal 5, which, as we’ll see, made all the difference. Although I’ve been critical of Manchester Airport in the past, all my annoyances are, if I’m honest, fairly minor (but all easily fixed). Generally-speaking, my experiences have been pretty smooth and this was no exception. After a series of relatively early flights, my flight down to Heathrow left at the relatively civilised time of 12.25. I think I’ve now caught almost all of the Manchester to Heathrow flights from early morning to lunchtime. This time around, I had a hire car to drop off, which I managed to do after some faffing, having originally got to the car hire place by 10.10. However, by 10.40, I was standing at the Car Hire “Village” (a misnomer if ever there was one) waiting for the shuttle to Manchester Airport’s Terminal 3. This time my airport experience really was a breeze, rather than my usual rush. There was no-one at bag drop (other than the check-in staff) and, despite having to take my rucksack over to the oversized bag drop (a routine I’m now used to), by 11.00 I’d arrived at security and was out the other side by 11.10. Of course, this being Manchester, there had to be a little drama. Learning from my previous experiences, I took everything out of my bags, filling four trays in the process. Even so, my Travel Press still got singled-out for a closer look (I guess it is a suspicious metal cylinder at the end of the day). Despite this, 10 minutes has to be a new (Manchester) record for getting through security and the staff there remain the politest and most cheerful I’ve met in many security lines around the world. And I do appreciate that they err on the side of caution. So, there was I was, with a flight at 12.25, and it was 11.10. Time for the waiting game. Naturally there was no sign of which gate we were leaving from (although I guessed correctly) so I settled down in the main concourse and kept an eye on the monitors. As luck would have it, I found the only seat with a power socket, so I camped out there and plugged my laptop in. You’ll see why this was important later on. The wait wasn’t too bad, although I could have done without several people making loud phone calls or the parents who let their two children run around and play unsupervised, particularly since I’d found an otherwise quiet corner. There was also a coffee bar there, called Flat White, but the less said about that the better. You can see how I got on during the flight down and at Heathrow after the gallery. The flight down was on an Airbus A320, so I now have the full set on that route (A319/A320/A321). We were fully boarded by 12.10 and, miracle of miracles, pushed back early, taking off just after 12.25. The pilot estimated a 35-minute flight time, but we ended up holding over Heathrow for about 20 minutes, landing at 13.20, still ahead of time. As I mentioned, my previous two Heathrow transfers have been from flights arriving at Terminal 5, but where I’m leaving from Terminal 3. This involves catching a bus between terminals and going back through security. This time, however, my flight to Boston was also leaving from Terminal 5 and, to my surprise, I discovered that when you don’t change terminals, you don’t go through security again. So I just walked off the plane and into the main departures area. Although I’ve never needed the extra time, I’ve always tried to ensure I have about three hours to make the transfer, just in case anything goes wrong. With that in mind, I’d skipped the 15.10 flight and instead booked the next flight to Boston which left at 16.40. The other reason for allowing myself all this time was that on Thursdays, I have a conference call between 14.00 and 16.00. By allowing myself three hours and catching the 16.40 flight (instead of the 15.10 flight) I figured I could just about do the call from the airport. Naturally the call was cancelled, leaving me a three hour layover, which I mostly spent in Huxleys a restaurant on the upper level of the main terminal area where I had a very good vegetarian breakfast in lieu of lunch. The catering at Heathrow really has come on leaps and bounds, a stark contrast to the last time I ate at Manchester. I think that next time I have to do this (and I suspect I will be flying to/from Manchester for the foreseeable future) I’m going to cut down the layover if my flight leaves from Terminal 5 to 90 minutes, although I’ll still aim for a two-hour minimum if flying out of Terminal 3 since I want to allow time for the transfer and to clear security. For those who don’t know, Terminal 5 has three groups of gates, A, in the main terminal, plus B and C in satellite buildings. My flight was from a gate in the C-block so I had to get the transport over, a mini tube-train which runs beneath the terminals. With my flight due to leave at 16.40 and supposedly boarding at (don’t laugh) 15.40, I decided to head over there at 15.30, only to find that when I arrived, at 15.50, I was the first person at the gate. The flight was on an old Boeing 777-200 with no at-seat power. While there was plenty of seating at the gate (although not enough for a full 777), there were no power outlets. Not wanting to get on the flight without a fully-charged battery, I wandered off in search of somewhere to plug in, finding what I think were the only power outlets in the entire C-block. This was at the very far end of the terminal, where there was a little stand with a paltry four UK outlets, one US outlet and a couple of USB sockets. You can see what happened after the gallery. By the time I realised that my flight was boarding and returned to the gate, it was 16.15 and everyone else had gone on board. So for the second time on the trip, I had priority boarding and had failed to use it. Annoyingly, I wasn’t even the last one on, since someone else wandered on five minutes after me. I had booked my usual exit row seat, on the aisle, in the back section of the plane (26H if anyone is interested). As always on these transatlantic flights, there was more than enough legroom, plus the seat felt a little wider than the Boeing 787s I’ve been flying on recently. I’ve been flying to/from Boston, mostly on Boeing 777s, for almost 20 years now and there’s every chance that this one was flying back when I started. It was really starting to show its age though: as I’ve mentioned, there was no at-seat power, the TV screen was tiny and while the foldout table was just about big enough for my laptop, there wasn’t much scope for adjusting it. I found that if I slid it as far forward as it would go, it was in a just about acceptable position for typing. This was a far cry from when I next flew on a British Airways 777-200, but on that occasion, on my way to Bangkok, I was flying in business class. A few years ago, the lack of at-seat power would have been a major issue for me. As it is, my laptop is starting to show its age (although in my laptop’s case, it’s only 2½ years old, whereas the plane was probably 20 years or more). When it was new, I could easily get eight hours from it on a single charge, but these days, it’s more like five or six hours at best. Fortunately, London to Boston is about as short as you get on transatlantic flights, with the captain suggesting just over seven hours flying time. We were boarded with the doors shut by 16.30 and pushed back on time at 16.40, although we then, of course, played the taxi-around-Heathrow game, only taking off at 17.05. In the end, we were on the ground and at the gate in Boston by 00:50, about 7¾ hours in all. The flight itself was smooth, and, as I never tire of saying, uneventful. It was also largely empty, with maybe one quarter of the seats taken. In particular, my section at the back was almost empty. I reckon it could hold around 130, and I counted maybe 20 people. The flight followed a familiar pattern. The food arrived as we cleared the west coast of Ireland, and I had my usual vegetarian meal. After that, I spent about an hour dozing, then switched on the laptop and got down to some work, my battery just about lasting to the end. On some longer flights, there’s been a disappointing lack of snacks during the flights, so I was pleased to see the crew coming around with ice cream about four hours into the flight. We also got fed a sandwich about an hour before landing. Having complained about the age of the plane, one advantage of its advanced years is that the doors have larger windows. In more modern aircraft, particularly 787s and A380s, the doors have tiny windows, so I can’t see very much when I go wandering around. This time there were full-size windows in all the doors, so I got some good views, particularly as we crossed over the coast of Canada. Another good thing was that we spent most of the flight in daylight, chasing the sun across the Atlantic, but always falling further and further behind. As it was, it only really got dark as we passed along the southern coast of Newfoundland at around 22.15 (UK time). Just as on my flight to Miami, the cabin crew left the lights on for a good part of the flight, which I always appreciate. Landing was smooth, although we taxied around for a while before finding our gate. By the time I was off the plane and through customs, it was approaching bedtime, but of course, it was only nine o’clock local time. However, the first leg of the Grand Adventure was over. Check back soon for the next instalment to see how I had decided to get from Boston to Phoenix. This entry was posted in Boston, Brian's Travel Spot by Brian Williams. Bookmark the permalink.